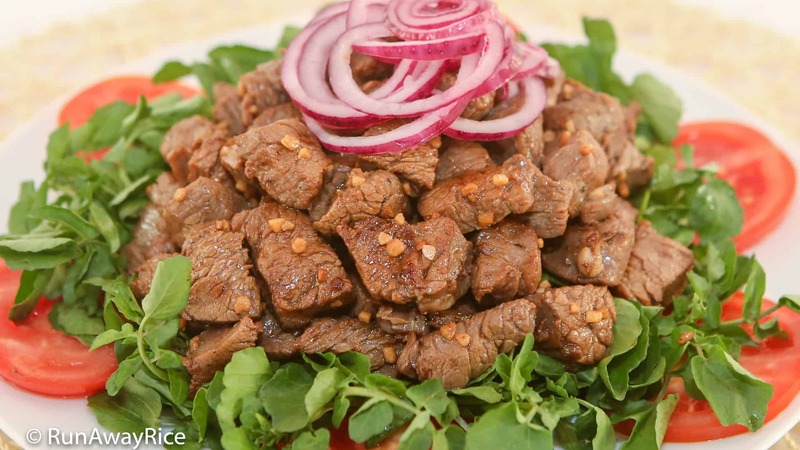 Sizzling Shaken Beef Salad is a mouth-watering dish made of savory stir-fried beef over crisp watercress, fresh tomatoes and tangy pickled red onions. The recipe is really straightforward and can be easily whipped up in 30 minutes or less. Serve this scrumptious dish as an appetizer with your favorite cold beverage or as a main dish. The beef is delicious served hot or cold and will certainly become a family favorite. Give it a try and share your comments with me! Selecting the right cut of beef can make or break this dish so, choose a tender cut. My favorite choice is flank steak. If you want to splurge, filet mignon is the way to go. I’ve used various cuts of sirloin in the past but find it to be a bit tough and not the best option. When cutting the meat, make sure to keep the pieces bit-sized, approximately 3/4 inch cubes. In this recipe, we cook the beef really fast to a rare/medium rare and so need it helps if the pieces are small. Another tip is to cook the beef in small batches and over very high heat. Have you ever noticed when stir-frying a big batch of beef the meat juices seeping out leaving the meat dry and leathery? This is mostly the results of cooking too much beef in the wok at the same time and cooking it for too long. The key is to cook in smaller batches so there’s more hot pan in contact with the meat. Cooking the beef quickly over high heat effectively sears the meat and seals in the juices. The recipe would not be complete without mentioning a little bit about the name. Some words are lost in translation and the name of this dish is a good example. A lot of people refer to this dish as “Shaking Beef”. Of course, the “shaking” refers to the way we cook the beef. We “shake” the pan moving the beef back and forth. If you’re really coordinated, you can toss and flip the beef instead of stir-frying with chopsticks. (Good luck with that!) The word “shaking” makes me giggle because I imagine a quivering cow scared for his life because he’s about to become dinner. I call this dish Sizzling “Shaken” Beef. Does that mean the cow is already disturbed and agitated? Like I said, lost in translation. 🙂 Perhaps the appropriate word for this cooking method is sauté and we should call it “Sautéed Beef”. Well, whatever the name, call it delicious! I hope you enjoy the recipe. Cut the beef into strips about finger width and then cut into small bite-sized pieces, about 3/4 inch cubes. Put into a medium bowl. To marinate the beef, add the sugar, minced garlic, vegetable oil, Vodka 5-Spice Marinade, fish sauce, soy sauce, oyster sauce and ground black pepper. Combine well. Cover and allow to marinate while continuing with the next steps. Wash the watercress thoroughly and shake off the excess water. Pluck just the tender greens and discard the tougher stems. Slice the tomato into thin round slices. Place the tomatoes on a large plate and layer the watercress on top. Cut the onion into thin round slices. Separate the onion rings. Transfer into a small bowl and add the sugar, vinegar and water. Toss together until the sugar is dissolved. Set aside for now. Heat a medium wok over High heat. (Make sure the wok is really hot.) Add 1 tsp vegetable oil plus 1 tsp minced garlic and stir-fry quickly for 5 seconds. Add 1/3 of the marinated beef and stir-fry quickly for 2-3 minutes for rare-medium rare. Optionally move the wok quickly back and forth to “shake” the beef. Remove the beef from wok and put on a separate plate. Repeat the same process to cook the remaining 2 batches. To serve, spoon the beef on top of the watercress and tomato salad. Add the pickled red onions on top. Enjoy while hot.